This is a 1901 Cram's New Census Atlas of the World Indexed Book. Lots of history and geography. It does need rebound. This is USGS Map I-703, “Geologic Map of the Near Side of the Moon. ”. This is a 1971 map, published during the Apollo program, but no doubt in progress from earlier. As you can see the map is a beautiful full color rendering of the geology of the moon. Item looks good and displays well. SOLD AS SEEN. This is USGS Map I-627, “Geologic Map of the Lansberg P Region of the Moon ” It also says “Lunar Orbiter Site III P-9, Oceanus Procellarum Including Apollo Landing Site 7 (Apollo 12)”. This is THE Apollo 12 landing site map, as well as the Surveyor 3 landing site. Original Sheet From circa 1936 Palm Beach Atlas by George Brockway, Civil Engineer. This Atlas Sheet is truly original! Palm Beach Atlas. Original Sheet From circa 1936. [1939 World's Fair] original Panoramic Map of New York by Geographia Map Co.
[, undated but 1939]. [An apparent 1939 World’s Fair Souvenir] Panoramic Map of New York. Areas of New York City are marked, including Greenwich Village, Chinatown, "Ghetto" and Harlem. On the verso is an uncolored transportation map showing the extensive system as far as Westchester county in the north and to Jersey City and Jamaica. This Atlas Sheet is truly original! Palm Beach Atlas by George Brockway, Civil Engineer. Original Sheet From circa 1936. Excellent for Framing. Includes Sailfish Club. The Sailfish Club is also on this sheet. This Atlas Sheet is truly original! Palm Beach Atlas by George Brockway, Civil Engineer. Original Sheet From circa 1936. Billionaires Row. This Atlas Sheet is truly original! Original Sheet From circa 1936 Palm Beach Atlas. Very rare - the few other Palm Beach Atlas copies that I have been able to find are bound like a book and it is unlikely that individual sheets will be put on the market. Everglades Island. Tarpon Island. Original Sheet From Palm Beach Atlas. This is a very cool sheet. Vanderbilt - Pillsbury - Kroger - Dodge - Ordway - Sloane - Trippe - Kay. Sheet #23 Original Sheet FromPalm Beach Atlas Circa 1936. Sheets 16, 16-A, 17, 17-A. Lake Worth, Intercoastal Waterway, to the Atlantic Ocean and Royal Poinciana Way South to Barton Ave. Amazing detail. These Atlas Sheets are truly original! The only markings on these four sheets are in the residential area just South of the Breakers on sheets 17 and 17-A. This Atlas Sheet is truly original!geobvcom. Palm Beach Atlas by George Brockway, Civil Engineer. Original Sheet From circa 1936. Excellent for Framing. This Atlas Sheet is truly original! Palm Beach Atlas by George Brockway, Civil Engineer. Original Sheet From circa 1936. Lake Worth to the Atlantic Ocean. This Atlas Sheet is truly original! Palm Beach Atlas by George Brockway, Civil Engineer. Original Sheet From circa 1936. Lake Worth to the Atlantic. This Atlas Sheet is truly original! Palm Beach Atlas by George Brockway, Civil Engineer. Original Sheet From circa 1936. This Atlas Sheet is truly original!geobvcom. Palm Beach Atlas by George Brockway, Civil Engineer. Original Sheet From circa 1936. Old Antique 1860 Hand Drawn Pen & Ink Map of Russia by C.E. Beckel. Notice detailed markings on mountain regions and rivers. Appears to be Northern Russia near the Arctic circle. Approximate size is 15" x 20-3/4". I usually carry 3 sizes Large, Huge, and Giant. Due to the large number of products most of our display pictures were not taken in real display rooms, they're digitally generated and the artwork sets in the display picture do not indicate the real size. This Atlas Sheet is truly original! Palm Beach Atlas. Original Sheet From circa 1936. Mappa Aestivarum Insularum. Alias Barmudas. Print Size 18" x 22". This Atlas Sheet is truly original! Palm Beach Atlas. My personal favorite. Pictures don't do it justice. Original Sheet From circa 1936. MY LOCATION REFERENCE ONLY: FOLDER 1-J. Bingham Island Audubon Preserve. Blossom Estate. Sheet #29 Original Sheet From Palm Beach Atlas Circa 1936. Blossom Estate Subdivision. Notes:On cover: 62nd edition with 1930 census. They are unmarked and appear not to have been used at all. This was published in 1972. The first photo above shows the entire large area map. The second photo shows the Apollo 17 landing site on that map. This is USGS Professional Paper 1080, “The Geologic Investigation of the Taurus-Littrow Valley: Apollo 17 Landing Site. ”. Published in 1981, this is one of only a few rare publications the USGS did on behalf of NASA in connection with the Apollo program. PRINT OBTAINED FROM THE RARE 1884 PUBLICATION. "THE SOLDIER IN OUR CIVIL WAR" BY FRANK LESLIE. A MARVELOUS RARE GIFT FOR THE CIVIL WAR ENTHUSIAST. UTILIZE THE ZOOM FEATURE TO GET A CLOSE LOOK. To complete the visual design, rivers are compared with the longest filling the open spaces as seen. Lengths of the Principal Rivers in the World. Heights of the Principal Mountains in the World. Issued 1846-9, Phila. This is USGS Map I-458, “Geologic Map of the Riphaeus Mountains Region of the Moon. ”. This scarce publication predates the Apollo missions, but was prepared with the Apollo program in mind. This is only the fourth serious attempt at creating a geologic map of the moon. There are also illustrations of mythological like fish swimming the seas and a bear cat like creature on the map. Beautiful 20th century antique map card, printed in relief. Both map and lettering around it are in raised relief. Relief Model of United States-. Abyssinia British East Africa Egypt Sudan Somalia c.1905 detailed old color map. Titled: State of New York, by Harry Pratt, Peerless Series, Published by C.W. Bardeen, Syracuse NY. Shows population of counties, cities and villages as of 1915. Map is dated 1916 at bottom. Very neat old map and displays very nicely. The Satirical Graphic The print features Crockett at center, a bottle of whiskey in one hand, and a bag of tobacco in another. Crockett's loyal hounds look on in the foreground. A stripped cat lounges above the bar. This Atlas Sheet is truly original. Sheet #1-A Palm Beach Atlas by George Brockway, Civil Engineer. Lake Worth Inlet Northern tip of Palm Beach. Southern tip of Singer Island. Original Sheet From circa 1936. It features cross-sections between Paris and Colmar, between the Ardennes and the Limousin, in the Pyrenees, between Cumberland and Durham (england), and in Derbyshire. A legend is included below each cross-section. 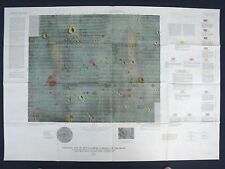 USGSMap I-627, “Geologic Map of the Lansberg P Region of the Moon ” It also says “Lunar Orbiter Site III P-9, Oceanus Procellarum Including Apollo Landing Site 7(Apollo 12) ”. This is THE Apollo 12 landing site map, as well as the Surveyor 3 landing site. Guessing at the date maybe a little earlier ?. Just a very cool map I almost missed the cigarette drawing it is so very light, I think I would just leave it, as it represents a partial image of the era ! This item is key to Plate 80, showcasing the "Pleiades". Paper is thick and sturdy. MY LOCATION REFERENCE ONLY: FOLDER 1-I.